CAIRO — Pope Francis urged Egypt’s leading imams on Friday to teach their students to reject violence in God’s name and preach messages of peace and tolerance instead, forging ahead with a delicate visit to the Arab world’s most populous country following a spate of deadly Islamic militant attacks against Christians. Francis arrived to a subdued welcome and a heavy police presence at Cairo’s international airport. But he brushed off security concerns by driving into town with his windows rolled down in a simple blue Fiat – not the armored “popemobiles” of his predecessors. Francis’ first event was a landmark visit to Cairo’s Al Azhar university, the revered, 1,000-year-old seat of Sunni Islam learning that trains clerics and scholars from around the world. There, he warmly embraced Sheikh Ahmed el-Tayeb, Al-Azhar’s grand imam who hosted the pope and other senior Muslim and Christian leaders at a peace conference. Speaking to the crowd, Francis recalled that Egypt’s ancient civilizations valued the quest for knowledge and open-minded education, and that a similar commitment is required today to combat the “barbarity” of religious extremism among the young. While Al-Azhar has strongly condemned Islamic fundamentalism, Egypt’s pro-government media has accused its leadership of failing to do enough to reform the religious discourse in Islam and purge canonical books from outdated teachings and hatred for non-Muslims. “To counter effectively the barbarity of those who foment hatred with violence, we need to accompany young people, helping them on the path to maturity and teaching them to respond to the incendiary logic of evil by patiently working for the growth of goodness,” he said. 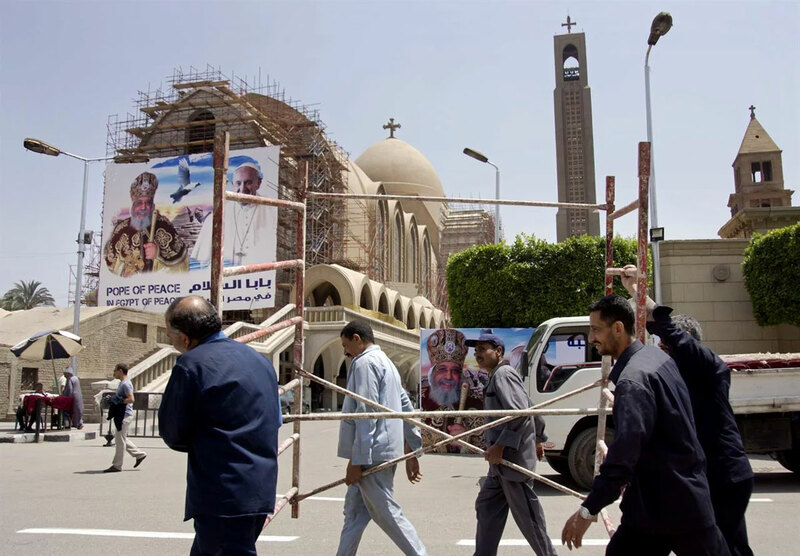 The Friday-Saturday visit is also meant to lift the spirits of Egypt’s large Christian community after three suicide bombings since December – including deadly twin Palm Sunday church attacks – killed at least 75 people. Egypt’s Islamic State affiliate claimed responsibility for the attacks. Egypt’s Abdel-Fattah El-Sissi, a general-turned-president, declared a nationwide state of emergency following the Palm Sunday attacks in a bid to better deal with the insurgency through wider police powers and swift trials. The visit to Al-Azhar marked a diplomatic breakthrough for the Vatican after el-Tayeb severed relations with Rome in 2011, after Pope Benedict XVI demanded Egypt better protect its Christian minority following a New Year’s Eve church bombing that killed more than 20 people. Francis has spent the better part of his four-year papacy seeking to mend the ties, and last year hosted el-Tayeb at the Vatican. His visit Friday cemented the renewed relationship. Later Friday, Francis will head to the seat of the Coptic Orthodox Church, whose followers are the vast majority of Egypt’s estimated nine million Christians, to meet its spiritual leader, Pope Tawadros II. Francis and Tawadros will preside over an ecumenical prayer service in St. Peter’s church, the central Cairo church hit by a suicide bombing in December that killed 30, most of them women. Together the two Christian leaders will pray for the victims of the attacks. Francis has frequently spoken out about the present day’s Christian martyrs and the “ecumenism of blood” that has united Catholic, Orthodox and other Christians targeted for their faith by Islamic militants. While Francis eschewed the armored “popemobile,” security was visibly tightened for the 27 hours he will be on the ground in Cairo. Streets designated for the pontiff’s motorcade around the Coptic Orthodox cathedral of St. Mark’s and the Vatican Embassy in the upscale Zamalek neighborhood were cleared of cars. Police also swarmed Zamalek, a Nile River island where Francis will sleep on Friday at the embassy. Policemen in riverboats patrolled the Nile in front of the embassy. Security men, meanwhile, were posted every hundred meters (yards) or so along the 20-kilometer (12-mile) stretch between the airport and central Cairo ahead of Francis’ arrival and armored cars were stationed in front of the presidential palace. The pope’s visit, however, is unlikely to cause much disruption to the city of some 18 million people as it falls on the Muslim Friday-Saturday weekend, when the usually congested traffic is significantly lighter. Pope urged Egypt’s imams to teach and preach tolerance, peace. He delivered a message of peace and tolerance ahead of his delicate visit to Egypt.